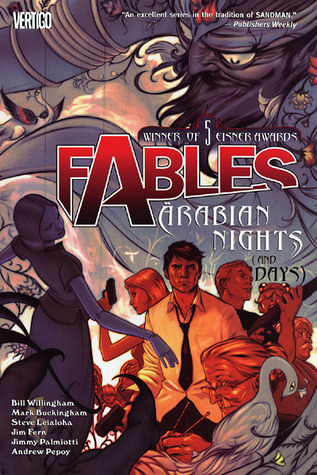 In the last volume of Fables that I read, we were briefly introduced to the concept of other Fables lands and in this volume that concept is explored in three of the four stories. Given that this is the seventh instalment in the series, there might be ****spoilers*** in the following review for the previous books. You can read my previous reviews by clicking here. The first story starts with the well established plot point about how badly Prince Charming is doing in his role as mayor. He now has a much greater appreciation that the job that King Cole and Snow White used to do in balancing all the needs of all the different residents of Fabletowns. It doesn't help that those broken election promises are still haunting him. I also wasn't all that pleased with one of the plot points to do with Prince I-really-should-be-called-Smarming. Matters take a turn for a worse when suddenly a limousine pulls up out of the front of the building and just sits there. No one knows who it is or what they want. Meanwhile, the occupants of the limo are waiting for their formal welcoming party, the one that will show the proper amount of respect for Sinbad, head of the Baghdad fables. Prince Charming has no clue how to deal with such favoured guests, especially ones whose ideas of what are normal and not going to be accepted to the modern Fables community. Talk about culture shock! The Baghdad fables have travelled to try and make an alliance with the American fables because it seems that the Adversary has turned his covetous eyes to new pastures and so they need to be able to fight against the invasion with other fables who have successfully defeated him in battle. What they don't know is that the entourage from Baghdad have bought something with them that has the power to cause chaos throughout both the Fables and mundy world - a djinn. Almost unlimitless power contained within a small bottle. Who knows what could happen if it was released! The search is on for ways to combat the power of the djinn, should they need it. I did enjoy the quick visit we made to the farm to see Snow and the cubs, and I loved seeing that Auntie Rose is the disciplinarian! Again, I missed Digby and I hope that he is back soon! Of the stories in this collection though, I think that my favourite was The Ballad of Rodney and June. Rodney is an ordinary wooden soldier, fighting for the Adversary. When he is injured he is sent to June for repairs. She is also fully wooden, and works to make repairs on the wooden soldiers. They are smitten by each other, and soon Rodney begins to woo her. Except, he doesn't really know how to go about this. There are no emotional sparks between them when they kiss, and then they realise that they don't have all the necessary parts that humans do in order to procreate. The whole story is told in the form of a letter to Geppetto asking him to make them both human. What they don't realise is that if their wish is to be granted, there will be a terrible price to pay and they have no idea what that might entail. I think I have one more Fables book to read before I need to switch over to the Jack of Fables series which interlinks with this one. I have already requested volume 8 from the library through interlibrary loan. With the identity of the Adversary finally revealed to the citizens of Fabletown, it's time to begin making preparations in earnest for the defense of their stronghold in the mundane world - and that means forging new alliances with whoever remains unconquered by the Adversary's legions. But the arrival in Fabletown of a delegation from the Arabian Homelands shows just how tricky this kind of coalition-building can be - especially when one side is concealing Weapons of Magical Destruction. Other contributors include Mark Buckingham, Steve Leialoha, Jim Fern, Jimmy Palmiotti and Andrew Pepoy. I really need to read these books and stop putting them off for other things. I am tending to have less success with print these days, and going for audiobooks, but a few graphic novels might do me well also. Thanks for the thought and care that you put into this review. I found it to be entertaining as well as enticing!! I am glad you are continuing to enjoy this series! Now Miss Zibilee. Go to your bookshelf and pull out number 1 and start reading! You'll soon be caught up me! These are so addicting.